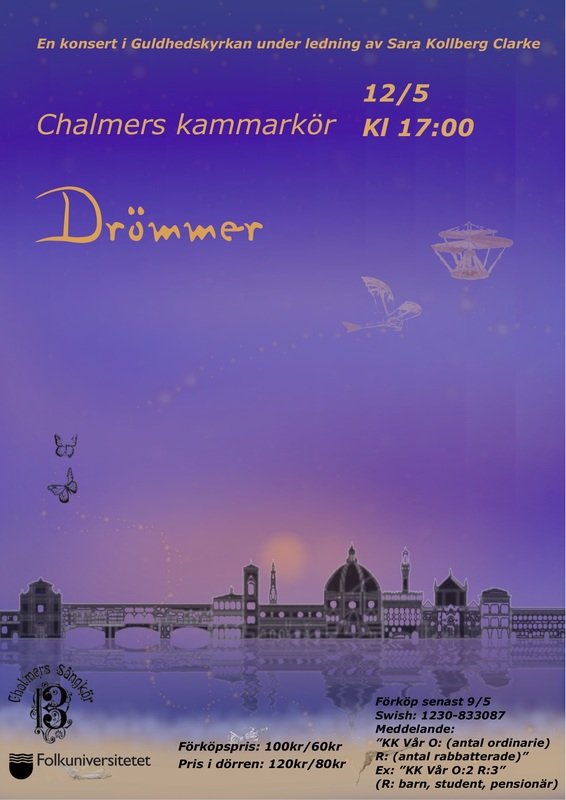 On May 12 at 17:00 the Chalmers chamber choir invites you to their spring concert called "Drömmar" which means dreams. It will be a lovely mix of dreamy songs like "Viva la Vida", "Hymn Of Acxiom", "Leonardo Dreams of his flying machine" and many more. Welcome! The concert will be in Guldhedskyrkan which is located close to both Chalmers and Dr fries torg. Tickets can be bought in advance with Swish before May 9. You can also buy your ticket at the door with payment card or Swish. Discount applies for students, children or pensioners. Buy your tickets in advance before May 9. Send your payment to the Swish number 1230-833087 and mark the payment with "KK Vår O:(number of ordinary tickets) R:( number of discount tickets)", for example "KK Vår O:2 R:1" which means 2 ordinary tickets and 1 discount ticket. To make the entrance as smooth as possible, make sure to remember the name of the person who sent the payment.